FRANKFURT MUSIKMESSE 2010 PRESS RELEASE: Gibson Guitar, the world's premier musical instrument manufacturer and leader in music technology will exhibit a host of new and exciting products at this year's Frankfurt Musikmesse, March 24-27, 2010 in Hall 4.1, Booth #E50. Along with the exhibits, guests can expect daily visits from some of the best known musicians from around the globe. Musikmesse is celebrating 27 years as the world's leading international trade fair for musical instruments. The entire Gibson family of brands will be on site at Musikmesse, offering guests an exclusive opportunity to experience new models and innovative new products, from the popular Gibson USA Slash Appetite Les Paul to the newest Wurlitzer Digital Jukebox, the LYRA. Highlights of the Gibson Guitar booth offer an array of electric and acoustic guitars, outstanding new Baldwin Pianos and the highly anticipated digital jukebox, while honoring the legacy of Les Paul, the grandfather of the electric guitar and inventor of multi-track recording. 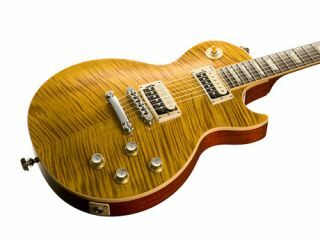 Gibson USA will highlight true rock icons with a display of the division's newest models, including the Slash Appetite Les Paul, the Sammy Hagar Red Rocker Les Paul, the Joan Jett Blackheart Melody Maker, the Angus Young SG, and the Zakk Wylde BFG guitar. Nowhere in the world can the power of such legendary artists be experienced all in one place at one time like this. Gibson USA's additional offerings include the 2010 Les Paul Limited Edition Standard (in honor of the late, great Les Paul), as well as the Tribal V, Grabber Bass, Holy Explorer, SG Standard, SG Carved Top, SG Raw Power and many other traditional models which have proven to be the most sought-after guitars in history. Gibson's next generation of Robot Technologies, the Dusk Tiger, takes center stage at Musikmesse this year, featuring a killer guitar with a look and construction that has never been seen before. Dusk Tiger represents the state of the art in electric guitars, redefining what the guitar can do with the integration of pioneering technology with the most advanced design in the industry, all produced in limited quantity worldwide. Building on nearly 400 years of tradition, paired with Gibson innovation, Wurlitzer announces the new Wurlitzer LYRA digital jukebox. The LYRA generates access to millions of songs on the internet and allows you to listen to your favorite radio stations and stream live music online. Users can build their own playlists with the comfort of a fast-acting touch screen and backup music from their own CDs, DVDs or mobile devices, attachable through USB ports and 320 GB of memory which gives space for over 60,000 mp3s. Wurlitzer took the best jukebox in the world and made it better. With ADAM ART technology, the Wurlitzer LYRA presents the highest fidelity in a compact and appealing design. With its modern design and operating features, the Wurlitzer LYRA is the ultimate music experience for the eyes and ears. Wurlitzer is famous for its Wurlitzer Peacock Jukebox and One More Time Jukebox, which have gone on to become some of the world's best-selling jukeboxes ever. Gibson Custom Shop stands by its reputation of offering some of the most collectible and limited guitars ever made, and guests of Musikmesse will not be disappointed. The Gibson Custom Les Paul Axcess and 50th Anniversary Les Paul Reissue in several finishes are sure to be show stoppers. Other Gibson Custom offerings from Nashville and Memphis include the 1959 Les Paul Standard Reissue, 1957 Les Paul Gold Top Vintage Original Spec model, Gibson Memphis' ES-335 Dot Reissue, ES-355 Curly Maple and 1960 Slim Neck ES-335 Vintage Original Spec. Gibson Acoustic, world renowned for excellence in craftsmanship, balanced expression and warm tones, will exhibit the world famous J-200 and J-45, Gibson's most popular acoustics, along with the Gibson Songwriter Deluxe and the iconic Hummingbird model. Rounding out the Gibson Acoustic displays will be new signature models including the Keb Mo Bluesmaster, the Aaron Lewis Southern Jumbo Limited Edition model, the John Hiatt J-45 Model, and a glimpse at the soon to be released Brad Paisley J-45 Model. Gibson Acoustic offers the most technically advanced guitars of its time while providing musicians an instrument that full expresses the warm sound and exceptional quality they have been known for. Jeff Waters, the guitarist and mastermind of the thrash metal band Annihilator and Epiphone signature artist, will officially launch his own Jeff Waters Annihilator Epiphone model with two appearances each day at the booth. Waters will be available to sign autographs and meet fans. Epiphone will also showcase the new Epiphone Electric Mandolin, the new Epiphone Les Paul Plustop PRO/FX and the Epiphone Masterbilt Cutaway Acoustic with electronics among many others. Epiphone has a long history of supplying some of the greatest guitarists of all time with the instrument they need to excel. And that history continues with the new "Annihilation-V," made in cooperation with legendary guitarist, Jeff Waters. Prestigiously ranked at #3 in Joel Mclver's 2009 book The 100 Greatest Metal Guitarists, Jeff and his band "Annihilator" have been shredding audiences worldwide for years and now he's ready to take it up a notch with what he calls "The Ultimate Metal Guitar!" For as long as there have been mandolins, there has been the problem of unequal string pair volume. This problem is even more apparent when attempting to amplify an 8-string mandolin using an ordinary microphone or monophonic pickup. Epiphone has solved that problem with the world's first mandolin that allows the musician to individually adjust string pair volumes using Shadow Germany's new Quad NanoMag™ pickup. Since 1952, the Les Paul guitar has stood the test of time and been the choice of countless guitarists, from Les Paul himself to Jimmy Page to Slash. Today, Epiphone announces a new Les Paul model that's sure to have the shredders in the crowd cheering: the new Les Paul Plustop PRO/FX, which combines all the great features and looks of a Les Paul but adds a double-locking Floyd Rose tremolo and coil-tapping for an amazing combination of crunch and versatility. When it comes to acoustic guitar tone and quality, nothing performs like an all solid-wood instrument. Harking back to the 1930's and their heritage, the Epiphone Masterbilt line combines traditional construction methods and features with premium all solid tone woods to bring you a new "vintage" instrument with deep rich lows, shimmering highs and just the right amount of mids. While many other guitars in this price class use pressed backs, spliced neck joints and even artificial wood backs and sides, you can be assured that every Masterbilt holds true to its all solid-wood promise. Building upon this promise is the newest member of the Masterbilt line - the DR-500MCE model, featuring an elegant rounded (Venetian) cutaway for easy upper-fret access and state-of-art electronics. For over 150 years, Baldwin Piano has graced celebrated concert halls and stages everywhere. Thousands of meticulous steps and only the finest materials go into the complex process of handcrafting a single Baldwin piano, carrying on the legacy of the world's finest piano maker. Baldwin Piano will exhibit the division's new vertical model B49 and new vertical model B342, both with a focus on international appeal. The 52" vertical Baldwin model, popular in Europe and Asia will also be on display. Daily demonstrations will also take place inside the booth. Baldwin Grand pianos on display will include the BD 152M Grand with player and 6'1" Grand (model 158) full size. If a guest of Musikmesse is looking for the coolest, hippest and most appealing gear and apparel offered, they will not need to look past Gibson booth #E50. Gibson's Lifestyle division will showcase the latest line of Gibson pickups, straps, instrument care packages and replacement parts, along with gig bags and closed and open guitar cases will be exhibited. Some will be seen for the very first time at Musikmesse 2010. New Gibson hats and shirts will be displayed in a special section of the booth devoted to this newest entry into Lifestyle and will give fans the opportunity to rock out in fashion.